Hiring a freelancer is a smart and affordable way to utilize outside talent for business success. You may hire a freelancer because no one in your company has the qualifications and skill to do something you need to be done, or because you only need a particular skill once or twice and can’t justify hiring full-time staff. To make the most of this hiring experience, you should invest in easy, accurate and efficient ways to pay freelancers. We’ve compiled a list of freelance payment methods to make sure your online payroll process works as smoothly as possible. Let’s dive in. Hubstaff provides a three-in-one app feature – time tracking, invoicing, and automatic payroll which supports PayPal, TransferWise, Payoneer, Bitwage, and QuickBooks. Hubstaff allows you to track the time your team spends working, while also capturing optional randomized screenshots, activity levels, and apps and URLs used. Combined, these features make it easy to manage and pay freelancers for their work. There’s no question about what was worked on, and by whom. To save you even more time, Hubstaff offers automated payroll, daily timesheet emails, and reports that can be customized for your use. The payroll function allows you to easily add a team member to your organization, set their pay rate, and automatically issue payments at time intervals you can decide on. In other words, you can pay freelancers virtually from within Hubstaff using the time they track on Hubstaff’s time tracker apps. You can also turn on timesheet approvals so that payments are only sent after you’ve reviewed each person’s time. Read about how we saved $30,000 on contractor payroll. Hubstaff also integrates easily with top project management software so your freelancers can track time directly to tasks. For an even better time and project management solution, check out Hubstaff Tasks. 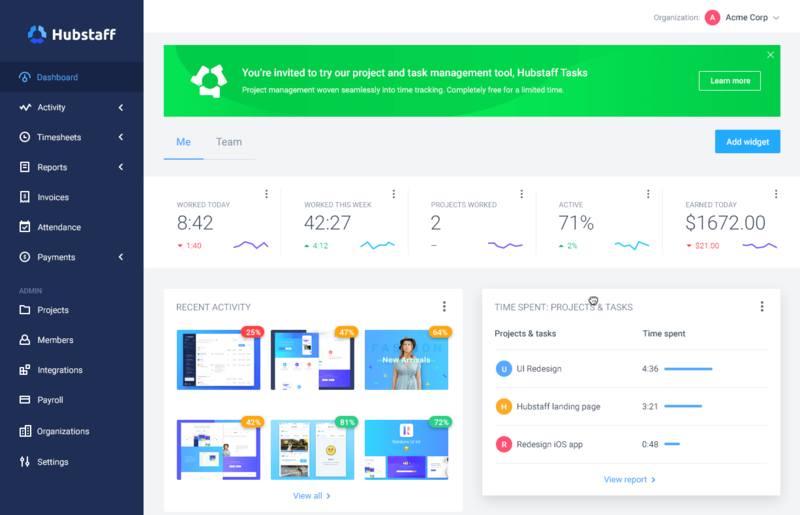 It’s a visual, kanban-style project management tool built to work with Hubstaff. Your detailed tasks include checklists, assignees, due dates, attachments and much more. Get started with Hubstaff’s automated payments and payroll. PayPal is the most widely used form of online payments for websites, companies, and individuals. It has 227 million active users, services more than 200 markets, and supports 25 currencies to serve a truly global market. Started in 1998, PayPal has a market capitalization of $100 billion, and the number of users has grown from 15 million to almost 250 million. In addition to being one of the most trusted and widely used money transfer service, PayPal also allows you to pay from your credit card, make bank account payments, PayPal wallet and a PayPal credit line. PayPal Mass Pay allows you to make mass electronic payments to multiple recipients with just one click. Payoneer offers mass pay so you can pay multiple freelancers with ease. Mass pay can accommodate anywhere from 5 to 200 beneficiaries, so you can use it no matter how vast your freelancer network is. Payoneer provides fast, flexible, secure, and seamless cross-border freelance payment option. It was founded in 2005 and has since grown to serve businesses and professionals in more than 200 countries and 150 currencies. Payoneer is the payment method used by popular freelance websites such as Hubstaff Talent, because you can find freelancers, track their time, and issue payments all through the same account. Funds are available quickly, as soon as 2 hours after initiating a transfer. View detailed reports that include payment history, freelancer information, account history and more. Learn more about how to make automatic payments with Payoneer’s mass payouts. Sync with bank accounts, track expenses with user-friendly accounting software, get expert support and opt to have a professional accountant take care of your taxes. Quickbooks is an accounting tool that also has a full-service payroll feature. Simply enter the hours worked and QuickBooks will do the calculations. To speed things up, QuickBooks has a Hubstaff time tracker integration that allows you to send automatic payments and payroll based on exact time worked. After you’ve paid your freelancers, you can also have an expert accountant take care of your taxes for you. Their payroll service comes with multiple features and unique benefits. Learn more about integrating Hubstaff with QuickBooks. Sign up with Facebook, free to make payments from U.S. bank accounts, major debit cards, and Venmo balance. Venmo is an online wallet that allows users to send money between Venmo accounts. Just connect your bank accounts or cards, load up your Venmo balance, and send payments to freelancers. This service doesn’t offer a fee calculation tool, so clients will have to determine how much to pay their freelancers manually. And it’s only available in the United States. Visit Venmo.com to learn more. 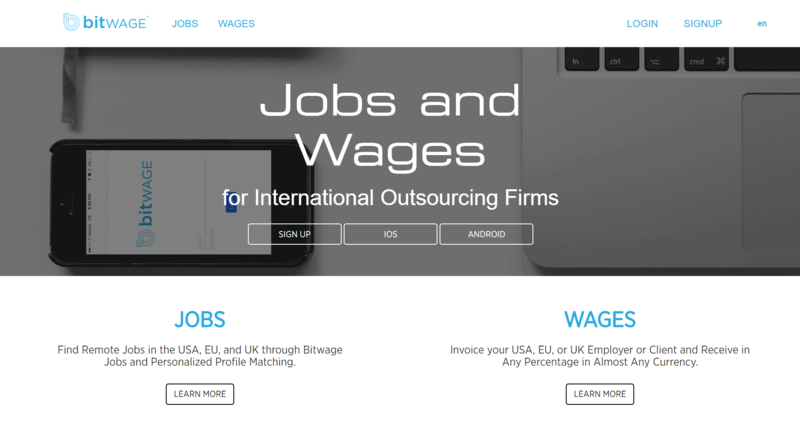 Pay your team of freelancers, contractors, and virtual assistants with Bitwage. It’s simple to use, allowing you to create payroll and fund it using wire, ACH credit, ACH debit, SEPA, credit card or digital assets. Bitwage integrates with Hubstaff so you can make sure payments are 100% accurate. 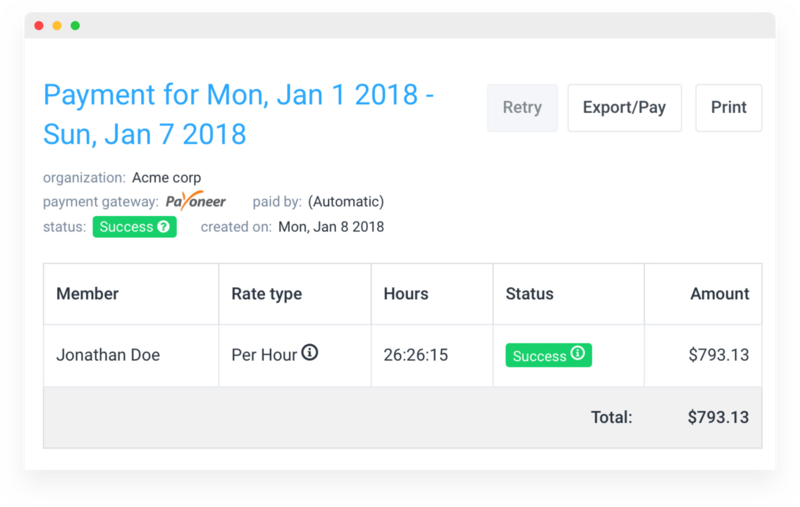 Add pay rates in Hubstaff, have your team track hours, and then use those timesheets to issue automatic weekly, bi-weekly, or monthly payments. Learn more about automating payments with Bitwage. Simple to use, lock-in exchange rates, transaction tracking online or via text, email or 24-hour phone line. Xoom is a money transfer service that operates in 32 countries and works with multiple currencies. It’s a straightforward service that will allow you to send money from your bank accounts or credit cards to a freelancer’s account. 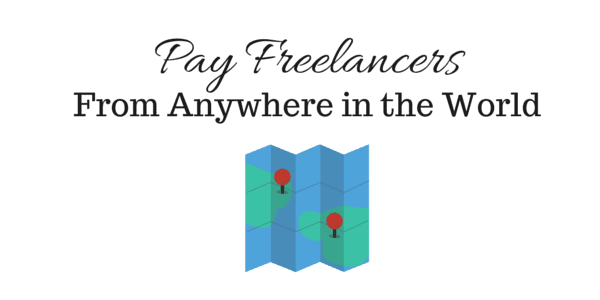 Freelancers also have the option of picking up their payments at specific locations, such as Western Unions. In some countries, Xoom also offers cash pickup and door-to-door deliveries. Learn more about how to transfer money with Xoom. 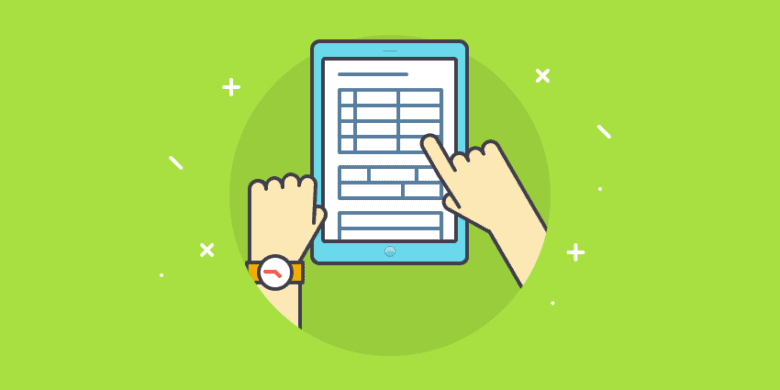 Batch payments simplify payroll by allowing you to send up to 1,000 payments at once. And, all at one low, transparent fee. 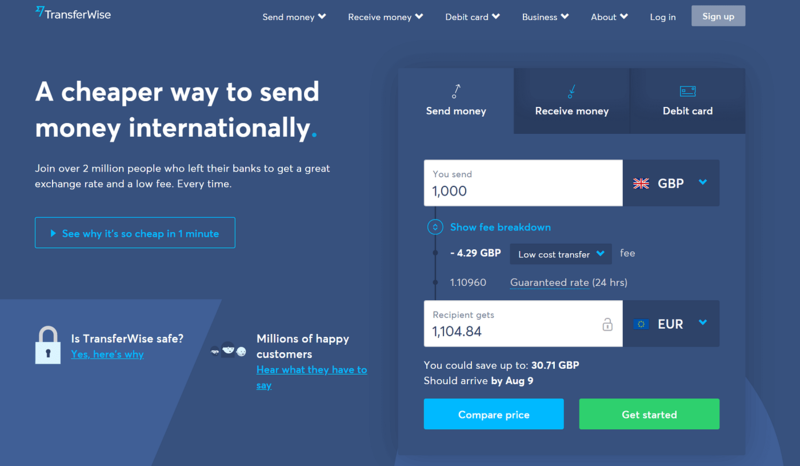 Transferwise offers easy, international payments for freelancers and remote teams. Multilingual customer support is available by live chat, phone or email. Learn more about how to transfer money with TransferWise. Now that we’ve covered our favorite and easy freelancer payment methods, we want to hear from you. No matter whether you’re a freelancer, or someone hiring freelancers, let us know: what are your favorite payment services? This post was originally published in 2015, and updated March 2019. Virtual assistants can be a great asset to any company, but it’s important to choose qualified virtual assistants and track their time and productivity. Businesses can outsource tasks to virtual assistants in order to get more work done, quickly, efficiently and affordably. But where do you start your search for reputable companies? Discover six virtual assistant companies in India worth trying out.